You know how you build something up in your mind and just hope beyond hope that it will be as worth it as you dreamed? 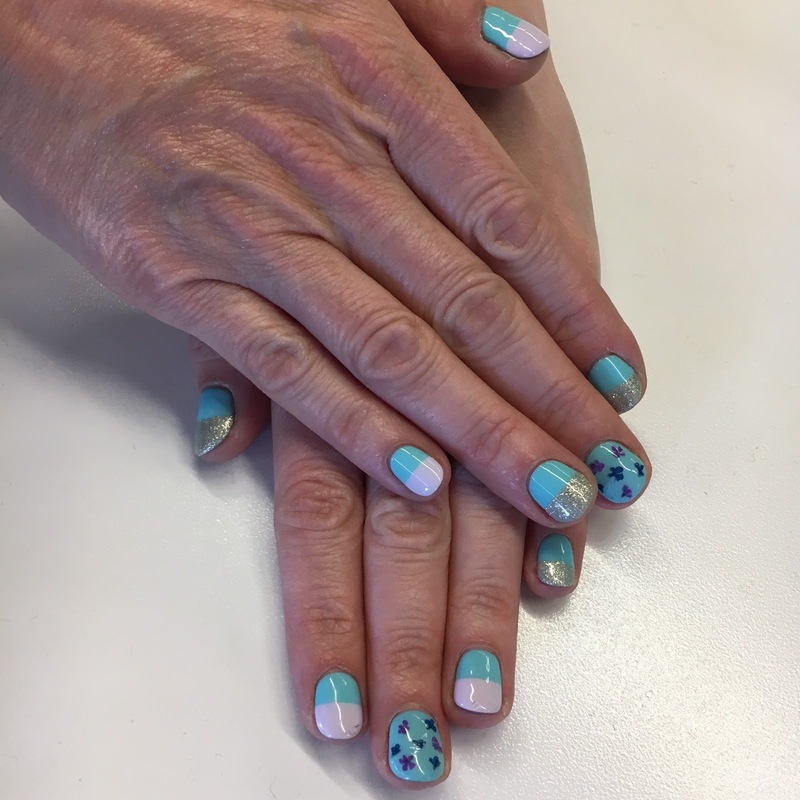 Well, in the case of Color Camp and my latest manicure, I got even more than I bargained for — because my experience from start to finish was, in a word, MANITASTIC. Yes, I’m making up a word to describe it, because it was JUST. THAT. GOOD. I had been wanting to visit Color Camp for about a year — I follow the nail salon religiously on Instagram and am always in awe of the incredible nail art they create. I really have no excuse as to why it took me so long to stop in, except that every time I would think about booking an appointment, there were none available! In fact, when I went on their website to look for one last Friday, I said to my friend sitting next to me, “Watch, they’ll be all booked this weekend, too.” Well, color me surprised, because they had an appointment available at 2:30pm on Saturday! Let’s just say I snagged that time faster than the Roadrunner escapes from the Coyote. So I walked into Color Camp, not really knowing what to expect, but knowing I’d walk out with truly fabulous nails. After checking in at the front desk, I was instructed to look at a selection of nail colors and designs on the wall and pick out what I’d like to do. The colors and designs are done on fake nails that are attached to magnetic black boards, so you can actually take them off and put them on top of your nail to see how they would look on you. The colors are organized by regular polish, gel and super gel (if you want nail art, you have to get either gel or super gel). The art is then organized into three boards by Seasonal Looks (a collection of looks they create every four weeks or so, similar to Paintbox), The Basics (French, half moon, half dip, French moon, ombré) and The Extras (studs, stripes, glitter, gem, foil, matte). Always a fan of excess, I simply couldn’t choose just one color or one design. I ended up choosing two colors, glitter and two designs, which I said my nail artist could put together however she would like. 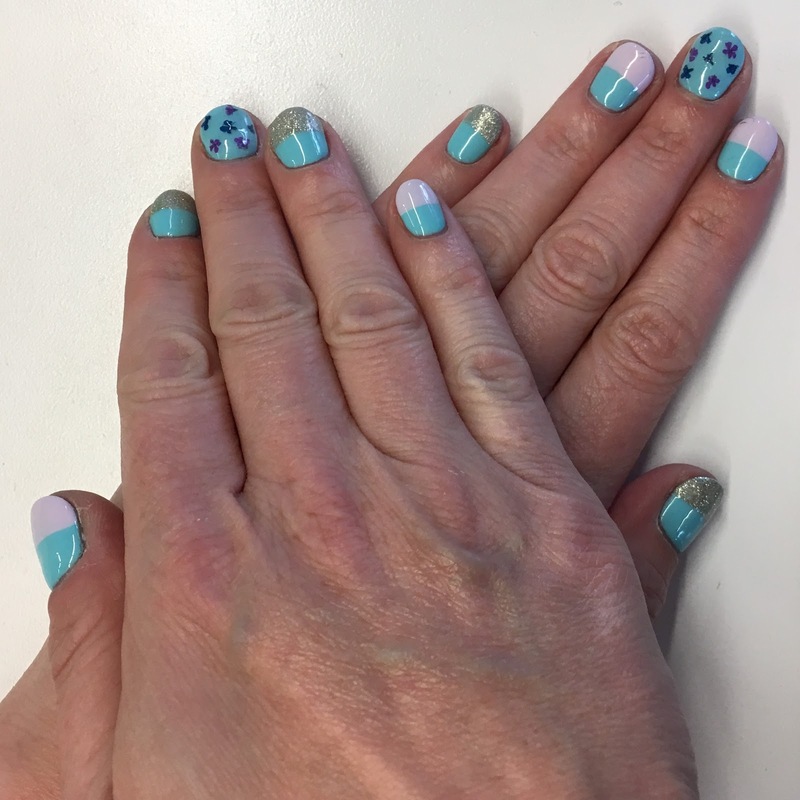 I will admit I confused the receptionist and nail artist a bit by choosing multiple colors and designs — I guess most people only pick one of each — so it took a little explaining, but we got there. And then the real magic happened. Color Camp only does manicures — and they are true masters of their craft! The long table down the center of the room was filled with artist after artist creating such beautiful designs — I was in awe of everything I looked at while I got my own amazing manicure! My manicurist, Violet, is not only crazy talented but such an awesome person to boot! We got to talking about everything from TV and movies to what we like to do in LA to our favorite nail polish brands ... and, to top it all off, we actually both experienced the same ankle break (hey, tib/fib!) with all the same residual surgeries, physical therapy, plates, pain and everything else! It was pretty nice to commiserate with someone who knew exactly what I had gone through two years ago. But, all that aside, what I loved most about Violet is that she took what I was thinking for the manicure and made it even better! I knew I wanted a teal base with glitter, half dip and pressed flowers — but I left the combination up to her. After some consideration, she actually decided to forego a full glitter nail in favor of half dip glitter with super gel, so we did a combo of that with the lavender half dip. For the flower art, we decided to do one nail on each hand — and I seriously love that we chose the middle finger for something so delicate and pretty! And guess what? Those flowers are REAL. Color Camp has boxes and tiny bags full of pressed flowers in every color! Not only did Violet spend a painstaking hour and a half on my nails - shaping, buffing (including work on my thumbnail that had been closed in a car door recently, ouch), and polishing to absolute perfection — she then took tiny tweezers to carefully select and place the flowers on my middle finger. I loved watching the magic of this manicure happen — it exceeded all my expectations, hopes and dreams for what Color Camp would or could be! And, even though I always love changing my manicure, I’ve actually kept this one for over a week and still am so in love with it. Plus, since it’s gel, it’s still PERFECT. Gotta love that. Now, I know you’re thinking that this nail art must have cost a fortune. Wrong! Color Camp gel manicures range from $40-$50 depending on if you get gel or super gel — I did a combination, but I believe I was still only charged $40 for that. Art is then charged per nail and ranges from $2-$4 per nail ($2 for the basics, $3 for the extras and $4 for the seasonals). When all was said and done? This manicure cost $60! I can’t say enough good things about my experience at Color Camp. I’m so glad that the place I’d been dying to go for so long ended up being even better than my wildest dreams! I will definitely be back. For more information about Color Camp and to book an appointment, visit color-camp.com. I love this mani! It is so much fun! Cute mani! She did an outstanding job!! Great review! I'm jealous. I would so love to have art on my nails. I love that the flowers are real. This is such a great experience. Those half glitter nails are fun! This sounds like a really fun experience! This is such a fun mani and that isn't a bad price either! Loving that mani! The blue shade is gorgeous. I didn't realize the flowers were real, this is really cool!